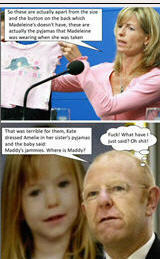 At the outset I should say that I don't know what happened to Madeleine McCann. All the evidence available to me – and there is more and deeper information available to the public on this than any case I have looked at – does not convince me of any theory or scenario being proved. Soon, in the coming months when my other projects are less busy, I hope to take a proper analytical look at it all and come up with some conclusions. But as things stand my position is that I don't know. Having said all that, there are aspects of the case which trouble me already and the main one is what the Metropolitan Police set out to do in Operation Grange. My brush with that investigation – and I call it that because I was never actually involved with it – has been the subject of a fair bit of comment, embellishment and misunderstanding. So it is right I think that I set out clearly what happened and what did not. 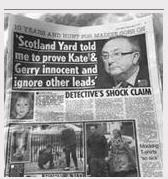 On Sunday 9th May 2010 the News of the World published a story which suggested that the Met was going to reinvestigate Madeleine’s disappearance and that I would be asked to lead it. This was news to me on both counts. Nobody from the Met had, or indeed ever did, make such a request of me. The only official news I heard about the reinvestigation was a week or two later when I heard that the idea of such a reinvestigation had been shelved for the time being in the wake of the change of Government. You will recall the note by former Chief Secretary to the Treasury Liam Byrne, apologising to his successor that there was no money left. The rumour in the Met was that, unless and until the Government were prepared to fund it, we would not undertake such an expensive operation which, as desirable as it might have been, was not really something on which Londoners should see their Council Tax spent. However, before this, just a few days after the NotW story I did receive a call from a senior officer in the Met whom I knew quite well. This officer told me I would do better to avoid the McCann investigation if it did happen, because "You wouldn't be happy leading an investigation where you were told what you could look at and what you could not". That is the totality of the advice I received. It was made clear that this was an ‘unofficial’ call and that it was made in my interest – so that I might not end up taking on a task which would ultimately frustrate me. As such I never pressed the caller for more information, nor will I ever be in a position to disclose who the officer was. I was familiar enough with the reporting of the McCann case in the media to understand that there was a widespread reluctance to talk of any scenario which did not involve an abduction and in which no blame or complicity was to be attributed to the parents and their friends. This struck me as odd but, in those days, quite frankly I was busy enough with he investigations I was involved in without undertaking any 'off the books' look at what had gone on in Praia de Luz. I had assumed that there was good reason for this; that those who had been involved had satisfied themselves that was the case. I retired after 30 years service in early 2011. 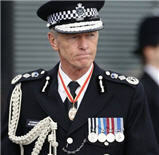 At the time I retired there had been no decision made to mount the Met operation. As I embarked upon a new career writing and commenting I looked at the case a little, sufficiently enough to provide sensible assistance to the media when they asked me. This was, though, always around police procedures and techniques. Nobody ever asked me what I thought might have happened, only what the police were doing, why and what they might do next. Last year Sky asked me to a meeting to discuss what a ten-year anniversary film might achieve. I explained that I would be willing to take part but that my position was one where I was as sceptical of the accepted (abduction) theory as I was of any other. I said I would also like to make the point that Operation Grange was so restricted from the start as to be destined to fail. In support of this I presented the original Grange terms of reference and told them of the advice I had received in the phone call. To their credit (and, actually, to my surprise) they accepted that this was a valid point of view to hold and one which should be presented in their film. Within the limitations and constraints of legal matters, the editing process and the need to present a rounded story, I think the Sky film was pretty good. It is certainly the most balanced mainstream report I have seen and one with which I am entirely happy to be associated. I also think it represented my views well. I am neither an anti nor a pro – of the McCanns or the media or the police. I felt, feel indeed, that the limitations which seem to have been imposed on Operation Grange were worthy of being publicised and would inform the debate. I am not necessarily advocating that it be started afresh, just that it is understood what it was and what it tried to do. I do though think that a point worthy of reinforcing is that a proper, conclusive and reasoned elimination or implication of Kate and Gerry McCann would have been in everyone's interest, most of all theirs. That would have been my first objective had I been leading Operation Grange and so that is the biggest issue I have with how that investigation proceeded. To eliminate or implicate those closest to the child in this type of case is not only the documented best investigative practice but is common sense. Had Grange done this then everything would be a lot clearer. I have no idea why this was not done but I am satisfied on what has been said by the Met and what is available that it was not. I want to continue to raise and discuss issues around Madeleine’s disappearance when it is appropriate to do so. I am mindful that, to maintain credibility and access to meaningful platforms that I will need to do so in a considered, reasoned and evidenced way. If I don't offer support to theories and assumptions it doesn't mean I don't understand or believe them, just that I don't think it is appropriate to adopt them or comment upon them at the moment. Finally a paragraph on me. I am nowhere near naïve enough to have thought that I could become involved in this debate without suffering some abuse and denigration. While it is water from a duck’s back I won't expose myself to it unnecessarily. Hence I won't take part in discussions on the various forums and I am likely to block those on Twitter who can’t be reasonable and polite. 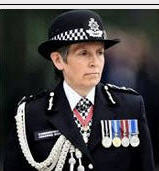 Like us all I am far from perfect but I did give many years of service to the community – as do thousands of others – and during that time I was lucky enough to achieve some results of which I will always be proud. My expertise and reputation is well-regarded by the media and I have no need to raise my profile; I turn away as much media work as I accept. 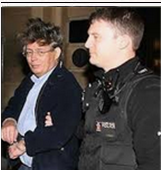 I am not writing a book on Madeleine McCann and I have no motivation other than that which has been with me for many, many years – to get to the truth. So I will continue to tweet about the case ( @colinsutton ) and when people raise good questions I will try to respond quickly.